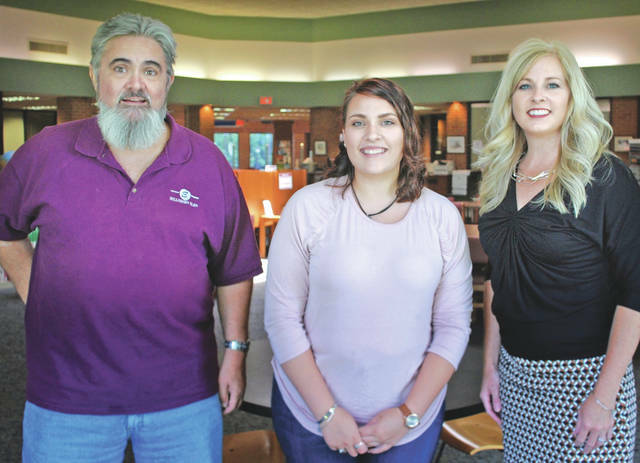 Dan Pearce (left) Hillsboro Elks Grants and Scholarship coordinator, and Dr. Nicole Roades, SSCC vice president of academics (right), present the 2018 Hillsboro Elks Scholarship to Madison Hatfield. The Hillsboro Elks Lodge and the Southern State Community College Foundation have announced Madison Hatfield as the recipient of the 2018 Hillsboro Elks Scholarship. Hatfield is a full-time student at SSCC, pursuing an Associate of Arts degree with a concentration in theatre. She began performing with the SSCC theatre department when she was 14, and later, as a high school senior, she began her college journey at SSCC through the College Credit Plus program. Following Hatfield’s college graduation in two semesters, she plans to transfer to the University of Dayton to pursue a bachelor’s degree in psychology. The $1,000 Hillsboro Elks scholarship is awarded to students who demonstrate financial need and who display a commitment to volunteerism and community service. Hatfield’s volunteer experience includes offering her service with senior centers, a soup kitchen, Relay for Life, no-charge mowing and dog-walking for elders, and volunteering with high school theatre productions. To learn more about SSCC Foundation scholarship opportunities, visit www.sscc.edu/financialaid/scholarships.shtml. For information on the stewardship role of the SSCC Foundation, please visit www.sscc.edu/about/foundation.shtml. Submitted by Kris Cross, director of public relations, Southern State Community College. https://www.timesgazette.com/wp-content/uploads/sites/33/2018/07/web1_Ells-scholar-pic.jpgDan Pearce (left) Hillsboro Elks Grants and Scholarship coordinator, and Dr. Nicole Roades, SSCC vice president of academics (right), present the 2018 Hillsboro Elks Scholarship to Madison Hatfield.